Last Saturday’s UFC on FUEL TV 7 event featured 12 fights, with nine of them being decided by the three judges sitting cageside. With so many scraps ending via decision, it’s easy to understand why most of the bouts didn’t leave a lasting impression. 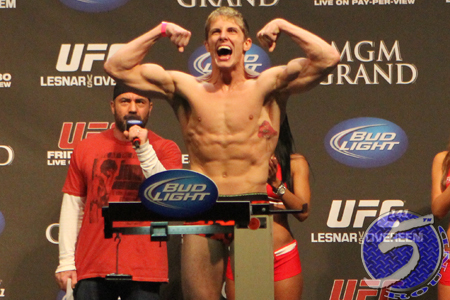 However, the welterweight affair between Matt Riddle (Pictured) and Che Mills certainly caught UFC President Dana White’s eye – or should we say, ire. Although Riddle cruised to a split decision victory – and who knows which fight the one judge who scored the bout in favor of Mills was watching, but that’s a different discussion we’ll save for another day – White was far from thrilled with the lay-and-pray that was on display. “I was frustrated with that fight … Are you gonna lay on him for three rounds?” White shared following Saturday’s press conference. “I’m sick of that [expletive], too. The other thing is, the ref will let these guys push up against the fence. The rule is, you’re either advancing your position or you’re doing damage. Mills had the clear advantage in the standup game, so it’s understandable why Riddle wanted to keep the Brit on his back. White doesn’t have an issue with the strategy, more so with the fact Riddle never really tried to finish the fight when it went to the canvas. Oh, and Mills better work on his wrestling and never give up attitude if he ever wants to perform in the Octagon again. “In that fight, [Riddle] took him back down again and I said, ‘That’s it. That’s what you’re gonna see for the next two minutes and 45 [expletive] seconds. Wake me up when this [expletive] thing’s over,’” White shared. “And boom, [Mills] pops up and he gets out and he gets in the guard. He throws one punch and he’s just sitting there looking at him. Then he stands up and he walks away. The bright side for Riddle is that he still left England with the W and a win bonus to boot. Unfortunately for him, White begrudging handed him his paycheck.